Flowers are like emissaries of beauty, greeting viewers with their myriad forms and colors. Indeed, the splendor they bring to Nature moves the hearts of people everywhere. For this reason, artists and writers all over the world have been attracted to flowers down to the present day, leaving behind many equally beautiful masterpieces. 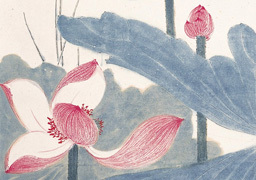 In China's earliest collection of poems and songs, The Book of Poetry (詩經), flowers often serve as metaphors for beauty. 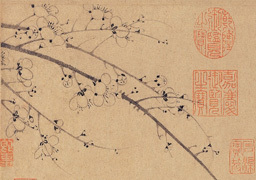 For example, "The peach tree is young and elegant (桃之夭夭)" uses the beautiful imagery of delicate peach blossoms to express the joy of a young maiden who has newly wed. "With a countenance like the (ephemeral) hedge-tree flower (顏如舜華)" refers to the varied colors of a plant known in ancient times as the hedge-tree (nowadays called the Rose of Sharon 木槿, or Hibiscus syriacus) to describe the beauty of a girl. Such descriptions reveal the ancients' level of observation regarding flowers some three millennia ago. 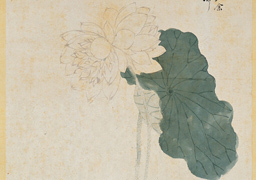 Over the course of Chinese painting, the three main subjects have been landscapes, birds-and-flowers, and figures. Flowers, a major subcategory in the bird-and-flower genre, became the object of attention and depiction by painters throughout the ages. 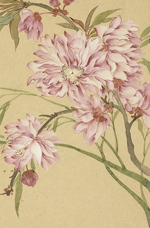 Artists not only directly portrayed the outer beauty of flowers, they also expressed the subtle spirit and demeanor of their subject. 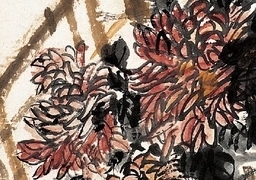 Painters went even further to imbue blossoms with deeper meaning, transforming them into objects for lodging feelings. 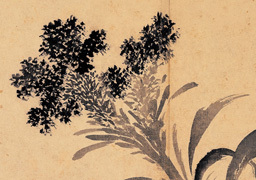 As the Ming dynasty author Wang Xiangjin (王象晉) wrote in Record of All (Flowers) Fragrant (群芳譜), "I try to observe the morning flowers putting on their splendor, competing in all their great beauty and fragrance. Some keep company with others as they grow, while others go against time and show their preciousness. Despite their great floral beauty and exotic nature, such myriad manifestations are not easy to grasp. Their flourishing stems bloom and wither, also bringing joy and sorrow. Who says that such lodgings of joy and pleasantries of the heart are unrelated to the emotions and character?" The themes presented below is from a special exhibition at the National Palace Museum in Taipei. There are four sections: "Beautiful Scenes All Year Round," "Formal Expressions of the Mind," "Their Many Features in Painting," and "Auspicious Signs and Lucky Omens." 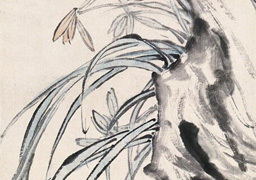 Flowers blooming throughout the year have been chosen to express their relation to the seasons and certain festivals in China. 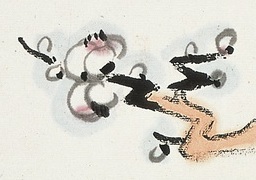 These artworks also demonstrate how artists used their skill of compositional arrangement and such basic techniques as ink outlines filled with colors (雙鉤填彩), "boneless" washes (沒骨), fine ink lines (白描), and freehand "sketching ideas" (寫意) to transform apparently simple subjects into a wide variety of forms and manners in keeping with the times. 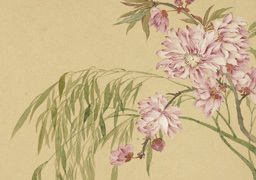 The interpretation of auspicious metaphors in paintings also reveals how artists portrayed blossoms from yet another point of view, allowing viewers to further appreciate the unique beauty and diversity of flower painting.